This odd upside down staircase is a monument to a man famous to the Catalan people, Francesc Macia i Llussa. Many tourists who stumble across this monument may not know the cause Macia i Llussa fought for. November 2014, panorama from 3 vertical images, additional exposures for highlights, focal length 16mm, aperture f/11, exposure 10 seconds, ISO 100, tripod. Macia i Llussa wanted independence for the Catalan people. He participated in a failed uprising and the Catalunya was only partially given an independence during the existence of the Spanish Republic. During this brief period of autonomy, Macia i Llussa served as Catalan president. Placa de Catalunya is a famous place in Barcelona which serves the modern purpose of a transportation hub for buses to the airport and other surrounding cities. This square struck my eye due to the strange monument in the center. 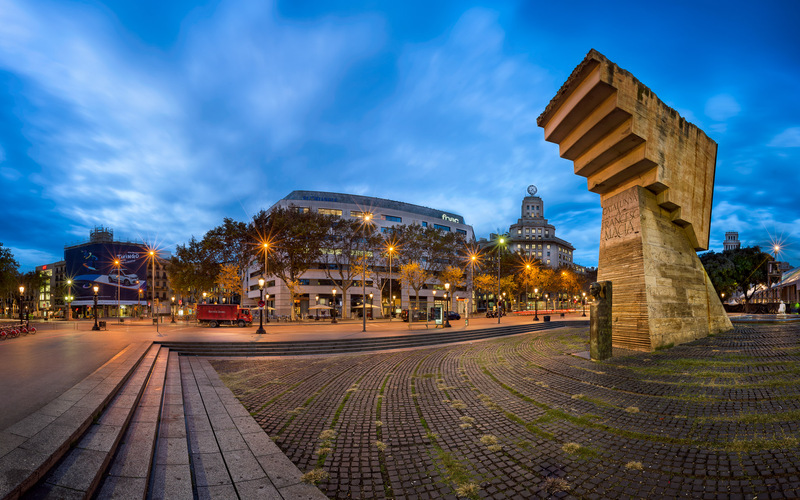 I returned to it one morning before sunrise which was only possible due to how close Placa de Catalunya was to my hotel. Luckily, the sky was cooperative this morning with intricate, blue clouds which added a dramatic feel to the scene. Due to the interesting angles of the monument, the opportunities for creative compositions were vast. I noticed one of the surrounding buildings had pyramid shaped steps which perfectly rendered to the shape of the staircase. This step juxtaposed to the monument made for a powerful composition.